Portugal’s PM Pedro Passos Coelho has said a court ruling striking down parts of his government’s budget means it will have to make other deep spending cuts. The European Commission warned it not to depart from the bailout terms, and said carrying out the agreed programme was a precondition for further help. “Any departure from the programme’s objectives, or their re-negotiation, would in fact neutralize the efforts already made and achieved by the Portuguese citizens,” it said in a statement. The Portuguese Constitutional Court struck down more than 1 billion euros ($1.3 billion) of savings that the right-of-centre government had said were needed to meet the terms of its existing bailout. 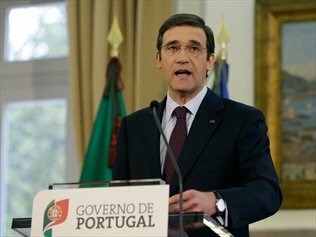 In a statement to the nation on Sunday evening, Pedro Passos Coelho repeatedly used the phrase “national emergency” to describe Portugal’s situation. He said the ruling striking down the budget’s suspension of holiday bonuses for public sector workers and pensioners – about 7% of their annual income – meant it must find alternative savings or seek a second bailout. The government would, he said, do everything in its power to avoid having to ask its European partners for more aid. “Today, we are still not out of the financial emergency which placed us in this painful crisis,” he said. Opposition leaders have accused Pedro Passos Coelho of using the court ruling as an excuse to press ahead with cuts to public services that he was planning anyway. They say the government must resign, having lost credibility after two budgets in two years were ruled unconstitutional.